"I'm in the air at that time, George. What about Monday at 4?" "Yeah, book it, Jane. Wait, what time zone? I'm in Central." "I'm Pacific, so it'd be 4 Pacific." "Um, that's 6 PM my time, so no, I can't. I have a violin recital I have to be at." "What about Tuesday at 1 Pacific, 3 Central instead, then?" "Oops. Wait, I have to check Bill's calendar…"
Kind of reminds you of this classic cartoon scenario, doesn't it? Stop the scheduling merry-go-round. Booking meetings, checking calendars, and finding time windows that work for invitees is a classic, time consuming operation. It's hard enough when two people in the same company are trying to find time--it's even more frustrating when trying to coordinate between people at three or four companies--all of whom use different calendaring systems. How much time per week do you spend (more like waste) on this problem? I know I spend at least a few hours. Cisco has invested heavily in making it easier to start meetings with our "one touch meeting" concept. Of course, it's not "one touch" to schedule a meeting. Approved Contact is a Cisco Integrator Partner that has solved the 'merry-go-round' of scheduling meetings. Approved Contact has integrated with all the leading cloud calendaring solutions - Office 365, Google Calendars, Apple iCloud, and more - and enables sharing of your calendar across your list of approved contacts. Even better, Approved Contact has also developed integrations into Cisco Spark utilizing our Spark API's, enabling participants in a Cisco Spark Space to easily book a meeting with the team using the Approved Contact calendar bot. 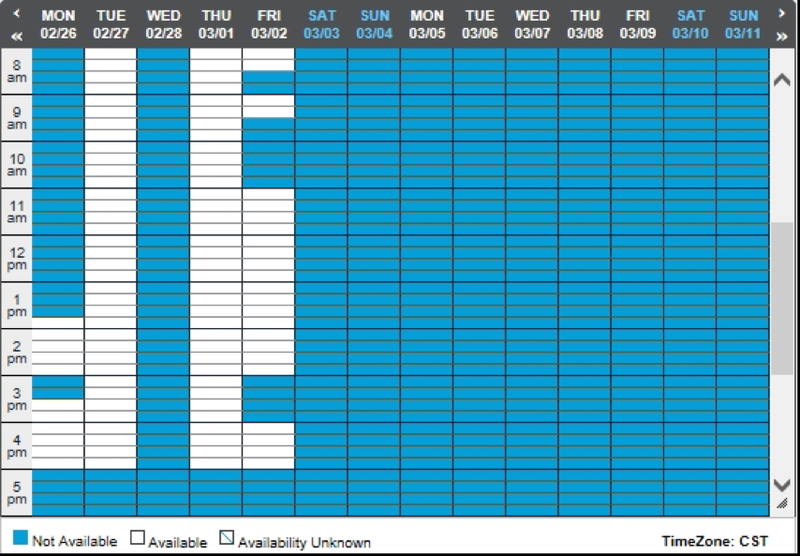 You can search availability in different ways, find next available, and schedule your meeting quickly and easily. End result - you're way more efficient with your time and scheduling meetings! It doesn't matter if the room members are in different companies, with different calendaring systems, and/or in different time zones - Approved Contact makes it simple and fast. The ROI for this solution is huge. Just run the numbers. If you save an employee an hour a month, taking into account their hourly pay rate, the Approved Contact solution for Cisco Spark can pay for itself very quickly. For me, although while obviously important, it's actually less about the ROI, though, and more about removing the friction and inherent frustration that comes with the scheduling merry-go-round we all perform. Plus, with Approved Contact, I have more time now to get other important things done. As a Cisco Spark developer, keep in mind that our Spark ISV development program has a specific goal to foster start-ups. Approved Contact is one of those companies we're working closely with. They're live with a few customers, offering a great solution that solves a huge problem. It's a great example of how our team supports new, innovative solutions. So what's your call to action? If you're just getting started as a Cisco Spark developer and think you have a cool Cisco Spark integration like Approved Contact, we definitely want to hear about it. Get started now by submitting a Cisco Spark integration to the Cisco Spark Depot.